New Orleans Saints wide receiver Tommylee Lewis (11) works for a coach against Los Angeles Rams defensive back Nickell Robey-Coleman (23) during the second half the NFL football NFC championship game Sunday, Jan. 20, 2019, in New Orleans. A longshot lawsuit seeking a possible do-over of the NFC championship game, which included a pivotal penalty that wasn't called, has been moved from state court in Louisiana to federal court. 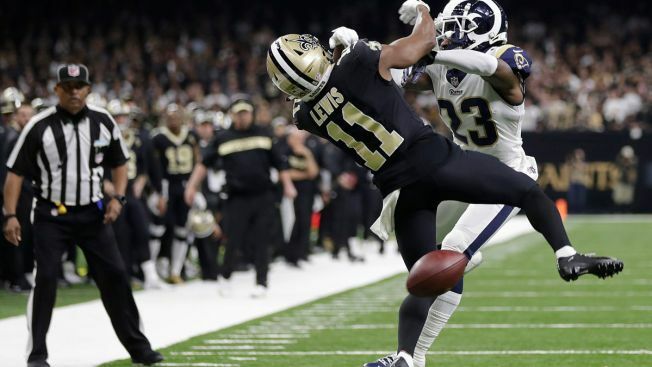 At issue is the failure of officials to call interference or roughness penalties when a Rams player leveled a Saints receiver with a helmet-to-helmet hit at a crucial point in the final minutes of regulation time in the playoff game. Had the penalty been called, the Saints likely would have run down the clock and kicked a potentially game winning field goal. In a legal filing obtained by The New Orleans Advocated, the league said replaying even a few minutes of the game would require a Super Bowl delay and more than $100 million in costs. The Rams went on to win in overtime and are set to play the Patriots in the Super Bowl on Sunday. Both team held fan rallies Sunday to send their teams off to Atlanta. The lawsuit by two Saints season ticket holders says NFL Commissioner Roger Goodell should implement a league rule that could mean reversal of a game's result or the rescheduling of a game. In the unlikely event that happens, the two teams would reconvene and the game clock would be set back to the point at which the Rams' Nickell Robey-Coleman plowed into Saints receiver Tommylee Lewis. Robey-Coleman admitted after the game that he "got away with one." The filing requests that NFL Commissioner Roger Goodell implement a league rule — rule 17 — governing "extraordinarily unfair acts." Remedies include reversal of a game's result or the rescheduling of a game — in its entirety or from the point when the act occurred. In a response filed Sunday to the suit by season ticket-holders Tommy Badeaux and Candis Lambert, the NFL's lawyers say Rule 17 does not apply. Click here to read the full text of the rule. "The NFL parties do not dispute that they have previously advised the Saints, including the club's head coach, that one or more penalties -- for pass interference or illegal helmet-to-helmet contact -- were mistakenly not called late in the NFC Championship Game, and that the NFL would like its officials on the field to make these calls," the document says. U.S. District Judge Susie Morgan is presiding over the federal suit. Records show she got the case after it was initially assigned to Judge Barry Ashe -- who removed himself from the case because he has Saints season tickets.